This Technical Shortlist provides a brief explanation of concepts and phrases that are in use for vibration, acoustics, pulsation and dynamic fatigue. Accelerometer. Transducer whose output is directly proportional to acceleration. Most use piezoelectric crystals to produce output. Acoustic Point Source. The acoustic source is a compact source, i.e. it exists at a mathematically-defined point and has a low internal admittance. As a consequence, its presence does not change the sound field. To mimic the point source, a physical load speaker must be small compared to the wavelength (λ/10 or smaller) and its natural frequency must lie well above or well below the frequency range of interest. The acoustic point source is necessary to be able to draw on the advantages of acoustic FRF and reciprocity. Similarly, the microphone must also be small as compared to the wavelength to be viewed as a point. Active Noise Control (ANC). Put in very simple terms, ANC uses a microphone to pick up sound and loudspeakers to suppress the sound that is picked up by emitting sound of opposite phase. Between the microphone and the speaker, controller hardware and software is used to analyse what the sound emitted from the loudspeaker should be. Multiple types of ANC hardware/software algorithms exist. Aeroacoustic implies that flow may cause sound and may even interact with sound and cause an instability of the flute-, flutter- or valve- type. Anechoic- Anechoic boundary conditions are non-reflecting boundary conditions. Waves that impinge on the anechoic boundary are consumed at this boundary. The anechoic boundary condition is easy to achieve in pipes with only plane wave propagation (as is the case in the analyses made in these pages). The anechoic boundary condition is more difficult to achieve on the spherical surface and Code Aster uses a special ‘rubber band mesh’ to minimise the reflected energy. Bump Test - A test in which the primary objective is to find an object's resonance frequency. A bump test is made in the following way: a sensor, usually an accelerometer, is attached to the object and the frequency spectrum is registered while the object is impacted at multiple locations and in multiple directions. The bump test is less precise than a FRF measurement, but is considerably faster. When registering XYZ direction vibration, a single bump test would replace 3·N FRF measurements, when a triaxial accelerometer is used with a multichannel analyser and N is the number of excitation positions. Last but not least, a bump test can be made using a single channel instrument. Coherence is a real valued function valued between 0 and 1, where zero signifies that the response (Y) is not caused by and/or linearly related to the stimulus (X). Damping is a physical process in which (acoustic- and/or mechanical-) vibration energy is destroyed into heat. This process is nearly irreversible. Note that damping and isolation often are confused with each other, as both involve a reduction of vibration level, though for very different physical reasons. See also. Damping, Critical – The smallest amount of damping required to return the system to its equilibrium position without oscillation. Damper Link – A device where a high loss viscoelastic damping material is sheared upon loading. The damping material shear converts vibration energy into heat and thus removes vibratory energy from the system. Reduced vibration amplitude reduces system mechanical loads and extends the system fatigue life. Decay of response is an effect of damping. Decay can occur with distance (decay rate) and/or apply over time (decay time). Experimental Modal Analysis (EMA) - EMA is a technique where vibrations are created from external excitation sources (Shaker or instrumented hammer) with the purpose of measuring FRFs of the system. From the FRFs of the system, the resonance frequencies of the system can be identified, corresponding to mode shapes and loss factor (damping). As an example; this information can show if the operating rpm or higher order of rpm is close to one or more resonance frequencies. EMA is often a good tool in cases where machines or engines cannot be run due to process limitations or if there are demands on limiting wear/damage. Far Field – Far field conditions are achieved in free field conditions at a distance away from the radiating/transmitting object. Far field conditions are, as a rule of thumb, approached at about twice the longest distance of the sound-emitting object. Sound intensity can be calculated from the sound pressure in the far field. Fatigue is a phenomenon in which material breaks from load cycling that may arise from static, thermal, environmental or vibration loads. Fatigue analysis can be made to analyse how many cycles of a particular stress range a system or component can withstand. A material SN curve combined with data on stress range and relevant stress concentration factors for the particular load case can be added together using Miner's rule to assess the fatigue risk. Feedback implies a process in which a system with input X that is influenced by a system with a transfer function H produces an output Y. The feedback mechanism is via a path, h, where the output Y now serves as an input to the feedback path h, and is added to the input X. The feedback path may add to —or detract from— the input X. When feedback is such that the input signal X grows, the feedback is unstable. A common feedback mechanism is that of a loudspeaker and a microphone, where sound from the speakers is fed back into the microphone and the system may become unstable at some frequencies. FFT– Fast Fourier Transform is used to transform fluctuations in the time domain into spectral components in the frequency domain. Periodic events with much energy will demonstrate themselves as high amplitude components in the spectrum. 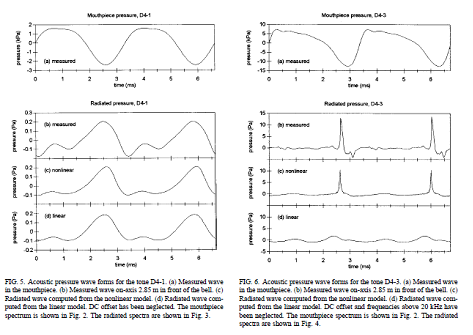 We use Autospectrum with amplitude shown as Peak in this report, as the events governing pump pulsation are harmonic, possibly with transient events mixed in the signal. Please note that the Autospectrum amplitude varies with the frequency resolution for bread band signals, but it remains constant for harmonic components as long as the harmonic components fall into a single frequency band. One must therefore be careful when examining spectral amplitude between cases. In this report, all Autospectra use 1 Hz frequency resolution, but the FFT used in the Time-Frequency spectrogram varies between cases due to software limitations. Flanking Transmission is a term used by acoustical engineers for when the sound bypasses the primary partition separating two spaces. Flanking sound transmission can be hard to pin down and quantify. The best way to avoid flanking transmission is to test in the design and construction phases. Free field – Free field conditions mimic the conditions of a perfectly outdoor field, i.e. the sound field approached when surrounded by perfectly anechoic boundary conditions. Frequency Response Function (FRF) expresses the linear relation between a response at a point and source input at a point as a function of frequency. A FRF (H) is a complex valued function, which shows the relation between response (Y) and stimulus (X). In the frequency domain, the relation between these is Y = H·X. The FRF can be shown as Amplitude/Phase or Real/Imaginary parts. The FRF can be shown as either a wrapped or unwrapped phase. An unwrapped FRF phase that grows with frequency (a steady line with a slope) shows wave propagation, whereas an unwrapped FRF phase that jumps back and forth shows waves to be reflected by changes in the system and creates standing waves. FRFs the se force as reference and vibration as response have specific names, where accelerance is acceleration/force, mobility is velocity/force and receptance is displacement/force. FRFs that use enforced motion as reference input also have specific names; inertance or dynamic weight is force/acceleration, impedance is force/velocity and dynamic stiffness is force/displacement. Note that enforced motion implies that all other degrees of freedom should be blocked and the constraint force/moment be measured at this degree of freedom. Such an operation is possible only in simulation tools and in special test rigs. It is possible to convert mobility to impedance using a matrix inverse, where the mobility matrix ideally should contain all 6 (3 translation, 3 rotation) degrees of freedom at each point. Such work usually is only possible in simulation environments. Harmonic(s) - extract from http://en.wikipedia.org/wiki/Harmonics . In acoustics and telecommunication, the harmonic of a wave is a component frequency of the signal that is an integer multiple of the fundamental frequency. For example, if the frequency is f, the harmonics have frequency 2f, 3f, 4f, etc. The harmonics have the property that they are all periodic at the signal frequency. Also, due to the properties of Fourier series, the sum of the signal and its harmonics is also periodic at that frequency. High frequency is a phrase that refers to a reference of some kind. In the case of human hearing, high frequency is usually sound that falls above the human speech range 250 Hz - 4 kHz. In the case of vibroacoustic modeling, high frequency implies conditions at which the wavelength is small in comparison with the object dimensions. For example, 1 Hz is high frequency for a large bridge that is a few km long, while 1000 Hz is low frequency for a matchstick. High frequency conditions favor low frequency methods, i.e. methods where the amplitude/phase data is unreliable and is replaced instead by power and energy. High frequency is the opposite of low frequency. HSE - Health Safety Environment is a way of working where risk is analysed before job is executed. HSE is based on the H.W. Heinrich triangle that was discovered in the 1930's. Heinrich worked as insurer and discovered the 300 - 29- 1 rule where 300 near misses caused 29 minor injuries and 1 death. The Heinrich triangle has since been expanded to include also At-risk behavior as well as Leadership Actions and, has been shown to affect company performance. For more information see: Link, Link, Link and, Link. Instability is a phenomenon where a transport process interacts with vibration (oscillation). A transport process is a process that involves flow, rotation, translation, and similar phenomena. Flow processes that generate and/or interact with sound/pulsation are referred to as aeroacoustics. A rotation that causes vibration/sound, for example in disc brakes, is referred to as break squeal. The physical mechanisms involved in both processes are similar. See also feedback. Impact – single, repetitive and random. Given A short duration event of time, t, will generate a response at all frequencies below the frequency ~2/t. Repetitive events, i.e. events that occur with uniform separation in time, T, will generate discreet frequency components from the fundamental frequency, 1/T with harmonics of uniform amplitude up to the frequency ~1/t. Impacts that arrive randomly spaced in time and amplitude also generate a response at all frequencies. This response is continuous and operates like white noise. Random impacts tend to favour the excitation of natural frequencies in the object excited. Impact Test – A response test where the broad frequency range produced by an impact is used as the stimulus. Sometimes referred to as a bump test. Impulse Hammer – A hammer instrumented with a force transducer. The output is directly proportional to the force. FRFs can be measured when a force serves as reference and vibration is the response. 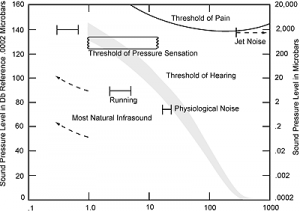 Infrasound – The frequency range below 20 Hz, where sound is not clearly perceived as audible sound. However, this does not imply that humans are insensitive to pressure fluctuations at this low frequency. Infrasound is complicated by the fact that it is ‘felt’ using human sensory inputs that are uncommon and, therefore, hard to verbalise. 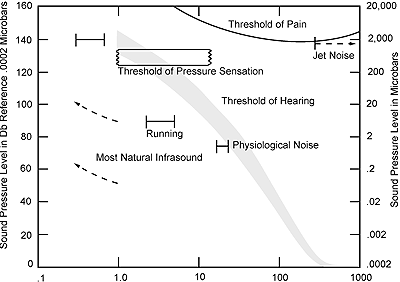 Infrasound is not perceived below a threshold value, above which humans react strongly, e.g. by acoustically-induced eyeball resonance or high particle velocity that vibrates neck hair and creates strangely perceived visual/audible phenomena. These effects are sometimes used in amusement parks to create ‘haunted houses.’ Infrasound can be emitted via the piping and from unsteady process gas jets at the end of funnels. However, infrasound excitation is very high from breaking waves and wave motion in harbours. Therefore, any concerns regarding infrasound should not be made without relation to such natural infrasound excitation. See http://en.wikipedia.org/wiki/Infrasound (Note that some of the current statements of this link are speculative as of 2009-12-28). 110-130 dB re 20 mPa, . Kinematic Pressure is the pressure produced by flow ('wind') and can be expressed as 0.5·ρ·U2, where density is denoted as ρand the flow velocity is U. Linear - a linear process often is tractable as it allows the use of simpler mathematical assumptions and simpler theory. A system often is linear when vibration amplitude is low in comparison with other motion or loading phenomena. See the discussion on wave steepening for examples. Lock in – Flow-excited pulsation produces a situation where flow generates pulsation and pulsation affects the flow. This system forms a feedback loop like that found between a microphone and a loudspeaker system. The phenomenon is often referred to as whistling. Small changes in flow can lead to a pulsation amplitude that is 10 or 100 times larger when going from a situation without lock in to a situation with lock in, i.e. with flow-excited pulsation. Low frequency is a phrase that refers to a reference of some kind. In the case of human hearing, low frequency usually is sound that falls below the human speech range of 250 hz - 4kHz. In the case of vibroacoustic modeling, low frequency implies conditions at which the wavelength is large in comparison with the object dimensions. For example, 1 Hz is high frequency for a large bridge that is a few km long, while 1000 Hz is low frequency for a matchstick. Low frequency conditions favor low frequency methods, i.e. methods that rely on accurate amplitude/phase data. High frequency is the opposite of low frequency. Modal Analysis –The process of breaking complex vibration into its component modes of vibration, very much like frequency domain analysis breaks vibration down to its component frequencies. Modal analysis can be made using FE analysis, or experimentally using EMA or OMA. Non-Linear is the opposite of linear. A non-linear system tends to have path dependent solutions, i.e. the output tends to depend on the order in which things happen. See the linear for more information. 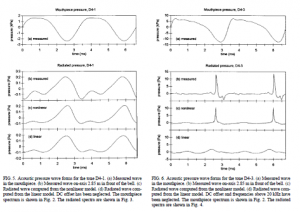 NVH– Noise Vibration Harshness. Noise and Vibration are obvious, but Harshness is less understandable, as it refers to a phenomenon in the human ear that requires a bit of explanation. Three sine tones that mix can sound either natural or raw/harsh, depending on which frequencies they have. The tones sound raw/harsh/unpleasant when at least two of the tones fall into the same octave frequency band. The tones mix in a pleasant way when placed as octaves, i.e. f, 2f and 4f Hz. NVH is the art of balancing these properties for a pleasant acoustic experience. ODS – Operating Deflection Shapes is a technique in which vibration across an object is shown using a geometric representation and visualised using animation. Geometry (points, lines and surfaces) is combined with tri-axial (xyz) vibration data to show motion. Put in simple terms, ODS can be thought of as Chladni patterns (the pouring of sand on vibrating objects) or stroboscope visualisation. Small amplitude vibration not visible to the human eye and parts hidden from view can be seen using ODS. Operational Modal Analysis (OMA) is a technique where modal functions are fitted to measured response without a known reference excitation. Order(s) relate to harmonics but instead of frequency use the rotating shaft speed as the reference. There is a relation to frequency in RPM/60 is 1st order of the reference rotating shaft. Order 1 denotes a single event per revolution, while order N happens N times per revolution. Orders are very useful in pinpointing the type of error that can generate a frequency spectrum. Unbalance is always 1st order, angle misalignment is 2nd order, bent shafts generate multiple orders, typically orders 1 and 3, and repetitive impacts from gaps or rubbing generate orders 1 to N. The value of N depends on the contact time of the impact and the stiffness of the impacting objects. The shorter the impact time and the stiffer the objects, the higher the value N. Having N blades or rotor lobes produces excitation at the Nth order and harmonics (2N, 3N, etc.). Order – N actions per revolution is called machine order N, or simply order N. Orders and RPM are integral in determining their frequency of operation, namely f = N·RPM/60 = N·RPS. The order N depends on which rotating component is used as the reference. To exemplify, a three cylinder pump that operates with one discharge event per crank operation will have its fundamental 'firing' frequency at order 3 and harmonics at orders 6, 9, 12, 15, etc. when the pump crank is chosen as the order reference. There is a gear located between the pump and the motor. As an example, assume that this gear has a ratio of 6:1 and we use the motor crank as reference. The pump firing frequency would then become order 3/6 = 0.5 and its harmonics would be orders 1, 1.5, 2, etc. Therefore, when using the concept of orders, it is important to understand which reference is used. Ovalisation refers to a situation where the pipe crosssection is bending. Ovalisation often is associated with increased vibration on the pipe, as well as increased noise transmission through the pipe. Ovalisation involving an odd number of half wavelengths tends to be more responsive than symmetric ovalisation modes. Piezo Cable – Pulsation can be indirectly determined using an externally-applied Piezo Cable, which measures the pipe’s crosssection oscillatory breathing motion (the so-called ring mode). Advantages in using a Piezo Cable are its very wide dynamic range (200 dB, or 1010 times), that it is fairly easy to apply, and that application of thye piezocable an integer number of turns around the pipe makes the sensor orthogonal insensitive) to motion from other pipe crosssection modes. That said, a Piezo Cable will pick up any loads applied to it, e.g. in-plane strain and/or torsion via Poisson’s ratio and direct impacts on the cable. Pressure, Line Pressure (LP) and Pulsation – We must distinguish between these three components to be able to analyse and discuss related problems. Pressure is what is picked up by the ordinary pressure gauge situated at the pump or wellhead. Line Pressure is the static, or rather, the slowly fluctuating mean pressure around which the pulsation component oscillates. Simply put, pressure is the sum of the Line Pressure and the Pulsation. Line Pressure changes so slowly it can be considered to be static, while Pulsation fluctuates more rapidly and causes vibration. Pulsation – Pressure fluctuations that propagate at the speed of sound inside of the pipe. A pulsation source can spread its load across large distances, as the damping is low inside of the pipe. Pulsation can be flow-driven under certain circumstances. This type of phenomenon is known to exist in process plants and can be very costly as it limits plant operation and to cause mechanical fatigue in piping. %LP = 100*Pulsation / (Line Pressure) – High values of %LP signifies a large dynamic content when compared to the average static pressure, i.e. when compared to the Line Pressure. High %LP values signal the presence of the non-linear wave phenomenon wave steepening..
Rainflow counting is a process in which major load cycles are identified from a time signal. Rainflow filtering is not a passive filter, but rather a numerical filtering procedure in which turning points are identified and the signal is processed to suppress low amplitude cycles in order to simplify and reduce work in downstream analysis. Reciprocity states that the FRF (respk/inputj), i.e. the response at position k caused by a source input at position j, is reciprocal with the FRF (respj/inputk). In our case, we use the acoustic reciprocity relation pj/Qk = pk/Qj, for sound pressure, p, and volume acceleration, Q, at positions j and k.
Ring frequency refers to the frequency at which one compression wavelength fit around the circumference of a pipe cross section. The practical importance of the ring frequency is that the expansion/contraction of a pipe’s cross-section is no longer stiffness-controlled and the stiffening effect from curvature is no longer present. In other words, the ring frequency can be noisy and the cylinder behaves like a flat plate at frequencies above the ring frequency. The ring frequency is easy to estimate as fr = c/(πD), where the compression wave speed is c (5000 m/s for steel and aluminum) and the pipe diameter is D.
RMS – Root Mean Square. RMS values represent the signal energy and can loosely be thought to relate to signal ‘dose.’ Peak and Peak-to-Peak values relate to the RMS value by a so-called crest factor, which varies with the signal type. Impulsive time signals tend to have a crest factor of 3 to 4, i.e. the Peak value is 3 to 4 times that of the RMS value. A triangle wave has a crest factor of 1.1. RPM/RPS –Rotations Per Minute (RPM) can be converted to Rotations Per Second (RPS) as RPS = RPM/60. RPS has the unit Hz and matches machine order N = 1. RPS is also referred to as machine frequency. Salome – Salome is a pre/post processor that is integrated with Code Aster. See www.salome-platform.org. Shock may refer to short duration impulse from explosions, impacts or for repetitive phenomena such as supersonic shock waves found at Mach numbers greater than unity or Wave Steepening phenomena that arise at high vibration amplitude. See non-linear and wave steepening for more information. For short duration impulse, see Shock Response Tutorial and Shock and Vibration Measurement. SN Curve – A curve where S denotes Stress range and N denotes the number or cycles. The SN curve shows the fatigue properties for a material. Sound Intensity – Sound intensity or I, is the time averaged sound power per unit area and has the unit W/m2. Sound intensity can be calculated as I = p2/rc in the far field and at anechoic boundaries with only plane wave propagation. Sound Power – Sound power is the time averaged sound power radiated over a specified surface area, S, and has the unit W. The sound power is the source power when the specified area encloses the emitting object and is W = ∫I·S dS. Sound Pressure – Time averaged sound pressure, p, is the acoustic RMS pressure emitted from or existing inside of the object (here, the piping). Sound pressure has the unit Pa.
Steepening – see Wave Steepening. Strain – Expressed as ε = δL/L, strain is defined as a length change δL across a reference length L. Strain gauges can sense strain. For a discussion on strain measurement, see the Sensor section here Strain and other sensor types. Stress – Expressed as σ, stress is given by Hooke’s law σ = Y·ε, where Young's modulus is Y and strain is ε. Stress is derived from strain. Stress range is the same as the Peak-to-Peak value for harmonic events, but may also account for static load offset for the general load case. Structural damping factor– Expressed as η = 2·ξ =2·C/Ccrit, the structural damping factor is a measure n of the amount of hysteretic damping there is in a material or component. Structural damping is proportional to the component relative displacement or strain. See also damping. Thermal fatigue is a process in which temperature variation imposes stress cycles that may lead to fatigue. Vibration – Mechanical and acoustic vibration does not involve a net transportation of matter. The more formal definition is a motion without net displacement, i.e. oscillatory motion. In order to vibrate, inertia and a force that restores equilibrium must be present. Viscous damping is a velocity proportional damping mechanism, e.g. found in a dasphot with damping factor C [Ns/m]. Sound radiation is another damping mechanism that is proportional to vibration velocity. See also damping. Volume Acceleration (VA), Q, is a measure of the sourcestrength for an acoustic point source; its unit is m3/s2. VA expresses how much the point source radius expands/contracts with regard to time. For a loudspeaker, VA is the element area (m2) times the cone acceleration (m/s2). VA can be determined in numerous ways, e.g. by a lightweight accelerometer placed on the cone, or, as in our case, by measurements made in an anechoic chamber. Water hammer is a phenomenon that arises when there is a difference in LP between two fluid systems and a valve abruptly is opened. Water hammer is severe in liquids, as these are incompressible. The effect from water hammer can be lessened if a bladder or another flexing element is introduced in the path between the impulse source. See also impact. Wavelet – extract from http://en.wikipedia.org/wiki/Wavelet. A wavelet is a kind of mathematical function used to divide a given function into different frequency components and study each component with a resolution that matches its scale. A wavelet transform is the representation of a function by wavelets. The wavelets are scaled and translated copies (known as "daughter wavelets") of a finite-length or fast-decaying oscillating waveform (known as the "mother wavelet"). Wavelet transforms have advantages over traditional Fourier transforms for representing functions that have discontinuities and sharp peaks, and for accurately deconstructing and reconstructing finite, non-periodic and/or non-stationary signals. Waves propagate and, when reflected, can form standing wave patterns. Standing wave patterns are for n-bounded systems called modes. A wave that is able to travel without destructively interfering with itself undergoes free wave motion, as is the case for propagation in infinite domains or for standing waves. Waves that destructively interfere with themselves decay and response can then be maintained only through external excitation. Wave Steepening/Shock Wave is a non-linear phenomenon that arises when there is a large difference between the highest and lowest pressure in the wave. The wave speed is higher at high amplitude. The high amplitude section of the wave travels faster than its low amplitude section, thus deforming the wave front, see Figure 1.2. The wave front can build up into a compressed spike of high amplitude. A typical shock spike is very thin, as seen inFigure 1.3. Once formed, the shock wave travels faster than the wave speed until it collapses. Its buildup thereafter starts a new. A measure on the readiness to form shock waves is the so-called B/A factor, where A is the fluid bulk modulus (rho·c2, where rho is density at Line Pressure and c is the wave speed at Line Pressure). The B/A factor is ~0.2 for diatomic gas (air) and 5-6 for pure water. However, a mix of water and air can show B/A factors from 0.2 to 5-6 with an intermediate peak value as high as 10 000, as shown in Figure 1.4. A physical explanation is that the compression work is made in the tiny air bubbles that superheat and interact with the fluid. The peak B/A ratio is probably found in the balance between bubble size, the heat transfer to the fluid and the overall compressibility of the bubble mix. High amplitude shock waves may cause pump valves to open/close more often than they should and may affect the pump open/close timing, as the pump uses passive check valves. Shock waves may therefore interfere with valve life and pump efficiency. Shock waves may also fatigue safety valves, trigger false release of safety valves and fatigue small bore fittings, gauges etc. Shock waves collapse when exposed to acoustic damping, geometric disturbance etc. The shock formation distance is longer when %LP is low and the B/A ratio is low. Comment: Shock waves often are too fast to readily be picked up by the FFT. Whistling – A feedback phenomenon where flow affects pulsation and pulsation affects flow. See lock in.